My John Scheepers Kitchen Garden seeds arrived! 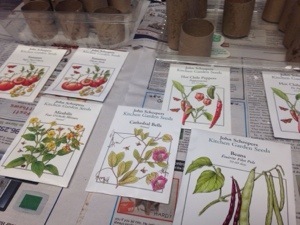 We quickly set to work getting these planted and added to the seeds we had already started. 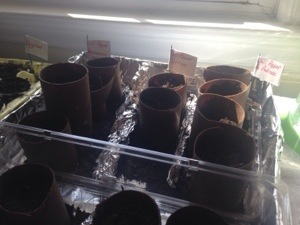 I decided to try toilet paper rolls for planting the tomato and pepper seeds. So far it’s worked out great! 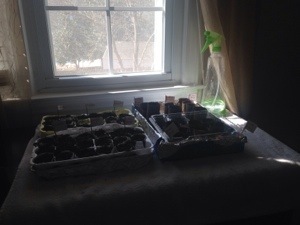 I recycled a strawberry container to hold the rolls, filled them with soil and then planted two varieties of tomatoes (Glacier Early and Sugar Pearl Cherry) and three varieties of chile peppers (Pepperoncini, de Padrone and Serrano). We also used more eggshells to start Emerite Filet Pole beans, Cathedral Bells Vining flowers, Mirabilis Four O’Clocks flowers, and more eggplants since the last round met an untimely end with previously mentioned cat debacle. I also ordered shelling peas that we will direct sow in the garden. My next project will be deciding how we will be build the raised garden beds and plotting it out!